A strategy is an action plan built to achieve a specific goal or set of goals within a definite time, while operating in an organizational framework. 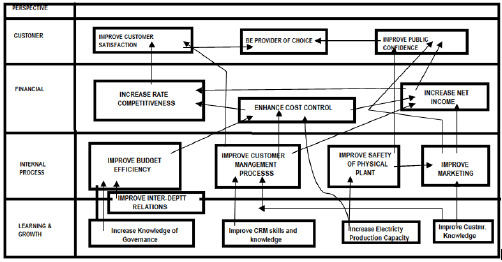 The following image is an example of a strategy map applicable to a public-sector organization. It shows how various goals are linked with one another and provides the trajectories to achieve these goals. Diagnosis − What problem needs to be addressed? How do the vision, mission and objectives of a firm imply its actions? Guiding Policy − What according to the firm’s approach will be the framework to solve the problems? Action Plans − How would the operations look like (in detail)? How can the processes be enacted to be in sync with the policy guidelines and to address the issues available in the diagnosis? Mintzberg hypothesized five basic approaches, popularly known as 5Ps that can help in developing a robust business strategies. Strategy as plan − Strategy is a directed course of action to reach the intended set of goals; these are similar to the various strategic planning concept. Strategy as pattern − Strategy here emerges from a consistent pattern of past organizational behavior. A strategy is realized over time rather than being planned or intended. Strategy as position − This includes locating the brands, products, or the companies within the market and industry depending on the conceptual framework of the firm’s consumers or other stakeholders. Strategy as ploy − This is a specific manoeuvre and manipulation intended to outwit a competitor. Strategy as perspective − This kind of strategy is based on the "theory of the business" or it may be a natural extension of the given mindset or ideological attributes of the organization.